According to industry observers, the integration of EMRs and revenue cycle management is likely to change HIM’s role. The final verdict may not be in, but early adopters of integrated clinical and revenue cycle management platforms say they are already seeing impressive results, whether they install the new systems piecemeal or enterprisewide in a “big bang” approach. “To some degree, we are still on the early side of the curve as an industry on this,” says Ed Ricks, chief information officer (CIO) at Beaufort Memorial Hospital, a 197-bed not-for-profit in South Carolina. Ricks and his board opted for an incremental approach to implementation, beginning with the hospital’s emergency department (ED). “There are certain areas where it’s just much more critical to capture that, particularly in the area of nursing documentation, and the [ED] is one of those areas,” he says. Beaufort Memorial installed an ED information system (EDIS) and realized a $1.3 million increase in gross revenue just one month after going live in December 2009. Ricks says his organization’s experience may be an example for others still contemplating automatic charge capture and the integration of clinical and revenue cycle management applications. Whether a hospital takes the incremental or the big bang approach to leveraging electronic clinical data to improve billing processes and reimbursements, Ricks and other industry experts say HIM professionals need not fear that wholesale job losses will accompany the shift from manual to dynamic coding and billing. However, they also say HIM staffs will need to adopt an enterprisewide and forward-thinking strategy as EMR adoption ramps up via the HITECH stimulus funding. Margret Amatayakul, MBA, RHIA, CHPS, CPHIT, CPEHR, FHIMSS, president of Margret\A Consulting, says HIM professionals must reassess their skills and ascertain the likely direction of the technology-enabled clinical/financial chart to secure their place in a facility. 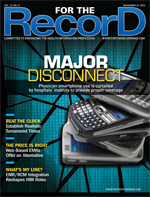 Lou Ann Wiedemann, MS, RHIA, FHIMA, CPEHR, the AHIMA’s director of professional practice resources, says the concern over HIM workers losing their jobs and finance department projections that coders can be eliminated to save costs as clinical and billing data integrate electronically are off the mark. Nevertheless, change is coming. “I think [automation] will change the way they do their jobs, but I don’t feel that it is going to totally eliminate positions,” she says. “Realistically, in the long run, some positions may not be filled through attrition; I think that’s going to happen no matter what. I think it’s very misleading to implement an automated process and assume the biggest gain or ROI [return on investment] will be a full-time equivalent position cut because, even with computer-assisted coding, somebody has to work a rejected report. “So the coder who was coding to begin with now works a smaller list of accounts that were rejected. You’ll gain efficiencies because coders who were spending their entire day coding now are working smaller reject lists and bills get out the door faster,” she adds. In theory, implementing an integrated EMR/revenue cycle management platform could, in time, yield enough data that more charts could automatically flow from the attending physician straight through billing without any intermediate intervention from HIM. However, even organizations that have successfully made the jump to the integrated platform say the rate of change in contracts such as reimbursement rates and preauthorization procedures—and a more likely chance of audits—means there is still a lot of human analysis necessary. “Could you set up some triggers and workflows and rules to have those codes automated? Absolutely,” says Rick Mohnk, CIO of HealthAlliance Hospital, a 150-bed facility in Fitchburg, Mass., that went live with an integrated Siemens Soarian platform in December 2005. “I don’t think, quite honestly, that there’s enough agreement among the payers that they would be willing to accept that. That’s not derogatory; everybody changes the rules too often. For instance, from one contract period to another, procedures that were not preauthorized before now need it or you don’t get paid. Ricks says keeping abreast of the multitudinous payer rule changes is just one of three main areas in which the role of HIM staff will change as clinical and billing applications are more tightly coupled. The third area Ricks sees growing in importance as platforms become more integrated is comprehensive chart review, especially as government and private payers place more emphasis on audits. Mohnk concurs, saying that in some cases multiple codes still require an experienced HIM person’s evaluation of a claim’s quality. “The doctor does the final diagnosis, but there are other codes underneath that not everybody can keep track of. That’s just a reality,” he says. That reality is also bound to become even more complex with the introduction of ICD-10. Its fivefold increase in codes will require an HIM role change from what Ajit Sett, vice president of revenue cycle solutions at Siemens, calls administrative to a peer professional role—staff who can offer physicians guidance under the complexities of the new system. In the not-too-distant past, physicians were uncomfortable with payers instituting more stringent evaluation and management (E&M) guidelines. The stricter the guidelines, many doctors said, the less leeway they had to practice the art as well as the science of medicine—not to mention how much lower reimbursements might be. However, Ricks says the experience at Beaufort Memorial has proven that tighter integration of clinical and financial systems has actually improved reimbursement. Under its Medhost EDIS platform, charges are calculated as every element of care is documented, enabling Beaufort to more accurately determine E&M levels. A medication documentation tool has also enabled Beaufort’s nurses to more accurately record IV infusion start and stop times. Improved E&M coding and IV infusion charges resulted in a net payment increase of $50 per ED patient within two months, and Beaufort expects that number to grow as more payments are received. Based on an estimated 40,000 patient visits each year, Beaufort anticipates that the EDIS will deliver $2 million annually in recurring net revenue. HealthAlliance has also seen substantial improvement in its bottom line since going with the integrated Soarian platform. For example, it has seen a reduction in average days of revenue in accounts receivable by 20-plus days, $1.1 million in payment rate improvements in the first six months of fiscal year 2008, a 99% accuracy rate for valuation of accounts receivable, and a 4.1% cumulative increase in net patient revenue. So You Want to Be an HIM Star? With results like those at Beaufort Memorial and HealthAlliance, integrating clinical and financial platforms may look like the default route of the future, giving HIM departments a chance to become more than coding experts. Wiedemann says HIM professionals must assert the discipline’s needs early in the planning process. “The biggest challenge for HIM departments is that as you implement the new technologies you have to maintain a legal health record that demonstrates information integrity, that the record is created in the normal course of business and meets standards in the community or industry at large,” she says. Susan L. Adams, a revenue cycle management consultant for the Healthcare Financial Management Association, calls the migration to integrated platforms “almost a ‘cleaning house’ opportunity” for HIM departments, from mapping existing processes to the new workflows to assessing whether hospital forms that patients have filled out for years are necessary or can be combined or eliminated. “It’s almost a chance to start from scratch to review how to build processes,” she says. — Greg Goth is a freelance journalist from Oakville, Conn., specializing in technology and healthcare policy issues.